Light Classics Arrangements for Guitar. Composed by Transcr. Jerry Snyder. Classical Guitar Folio; Masterworks. Alfred Classical Guitar Masterworks. Form: Transcription. Acoustic; Masterwork Arrangement; Wedding. Book. 52 pages. Alfred Music #00-44000. Published by Alfred Music (AP.44000). ISBN 1470618907. English. Transcr. Jerry Snyder. Intended for both working guitarists and those who play strictly for the enjoyment of great music, this collection of classical favorites is perfect for any wedding, party, or social gathering. 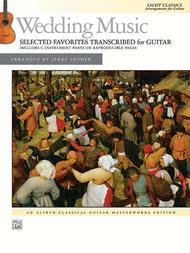 This adaptable edition can be used by a solo guitarist, a guitar duet, or a mixed ensemble with two C instruments, and includes classics such as Mendelssohn's "Wedding March," Wagner's "Bridal Chorus," and Pachelbel's famous "Canon in D." Reproducible treble parts are provided so you can make copies for other instrumentalists to play with you. A section dedicated to music in a wedding service, complete with a chart showing which pieces work best for specific parts of the ceremony, makes this a useful tool for the professional guitarist. Additional familiar classical masterpieces, such as Beethoven's "Ode to Joy," Bach's "Air on the G String," and Faure's "Pavan," will provide you with a repertoire of crowdpleasers for any event.